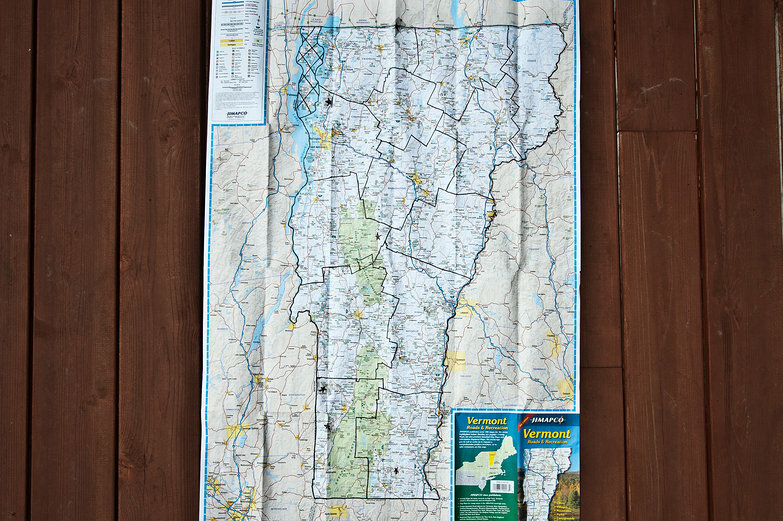 When we weren't working, leaping into rivers, sailing, or berry-picking while cat-sitting at Mike and Eliza's house, we were poring over another map, this one of a single state: Vermont. 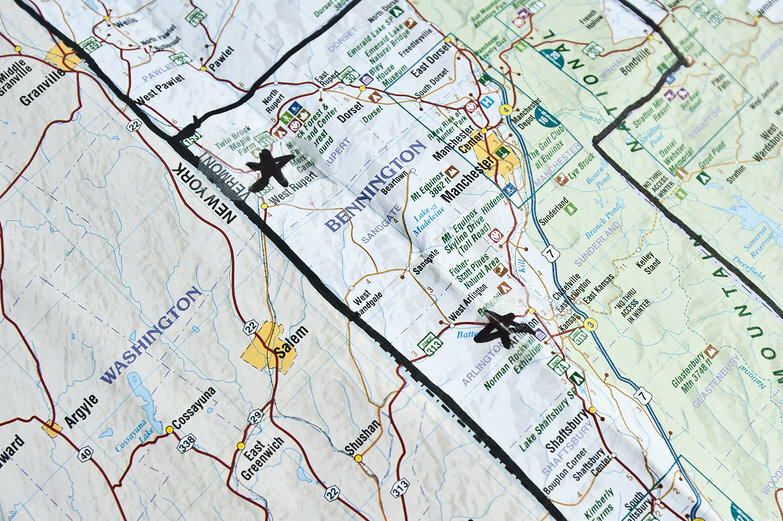 With some land-hunting experience under our belts, and our pool of possible homesites now limited to a very small V-shaped portion of New England, we were bolstered with confidence about the diminutive and refreshingly manageable area in which we could now start our search. First, we ruled out high-elevations, which happens to eliminate most of Vermont. It would be nice to live near the mountains, but we don't want to be in them. With an idea of where we'd start our search, we taped the map to the wall and got to work. Or rather, we began to play at window-shopping, searching through listings for properties on websites like LandWatch.com. We allowed ourselves a minimum of oohing and ahhing at their romantic descriptions, and then selected only those that were in our size and price range. Those, we marked as stars on our map. What we ended up with was a string of nearly two dozen properties to look at, forming a winding, mostly-vertical route crossing the entire western, non-mountainous portion of the state. To make sense of this disorganized smattering of data, Tyler created a spreadsheet, which we filled in with all the pertinent information like contact information, size, price per acre etc. Now, armed with map, spreadsheet, and plenty of advice from our friends, we're eager to find our home. Tomorrow, we leave Mike and Eliza's ramshackle farmhouse and will head west, making our way back to our families. But first, we're taking a day or two in Vermont to look at land. With twenty one possible properties to check out, it will be one heck of a land-hunting marathon. I loved the blog when y'all were traveling, but I honestly think I'm enjoying this land-hunting bit even more. And I'm ridiculously excited about homesteading vicariously through you--I hope you find the perfect spot! Gosh! Glad I'm not the only one on the edge of my seat with excitment for the two of you! What a sensible and orderly approach to finding your little paradise. Good luck! Consider aspect as well as slope when looking at land. Lots of people buy in the summer and curse the lack of sun in winter. If it's a nice piece and hasn't been built on yet you might want to ask why. Look at the whole neighborhood - any big changes planned? how do people make a living? Where are the schools? post office? town hall? you may not need/use these but others do. 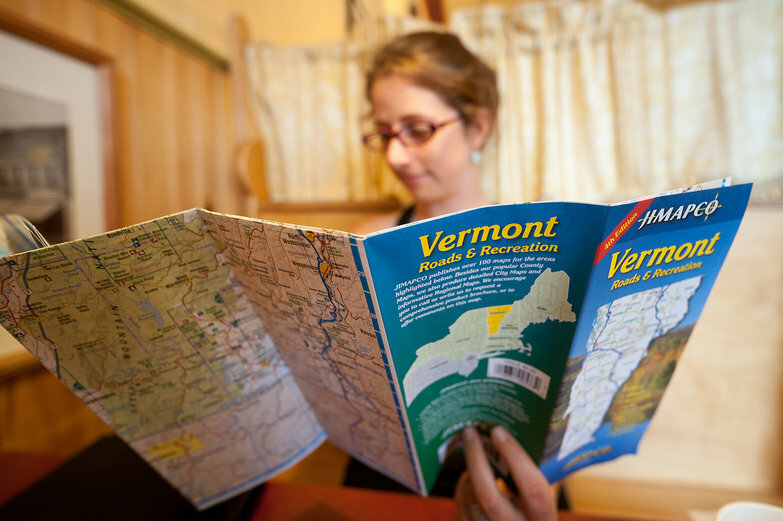 Visit Vermont in the winter, too. Kelly Ann & BB -- I'm so glad you're so excited about this! If it isn't obvious already, we're pretty excited too! Can't wait to find the time to get all caught up with journals so you can be updated on the most recent land-hunting scoop. et -- Thank you for your sound advice!